I'll be honest - for the last few years, most of my new year's resolutions have been pretty wispy. I've focused on positive thinking and stressing less... and that has clearly been a Good Thing, but this year I am also keen to set myself some creative goals and actually MAKE things. One of those goals is finding a happy blog balance (since my blog comeback I've been posting roughly once a week) and I think I'm getting there. It's not too much to commit to, it's easy to schedule a few in advance if I'm going to be busy, and bit by bit my readership is increasing so I'm not just chatting to myself (hello and thank you!). My next project is painting. If you've been following this blog for a while you may remember that I've said this before... painting is the hobby that I keep coming back to, and keep giving up when the going gets tough. But this year I've got a goal! I'm going to paint once a month in 2018. That's not that hard, right? One of the things I've always been a bit scared of painting is people, but when I picked up a paintbrush again (back in 2013!) it was the main thing I wanted to learn, and it's all I've really wanted to paint since. The problem is I'll have a little flurry of enthusiasm, and I'll paint one or two things, then I'll get distracted and run out of energy, and feel like I need to wait on my next creative spark... which in my case, seems to only strike once a year, and then the whole cycle starts again. So, for 2018 I am going to power through the creative block. I'm going to (try to) stop worrying about being good enough, and remember that the only way I'll ever get better is by practising! One painting a month is totally achievable. 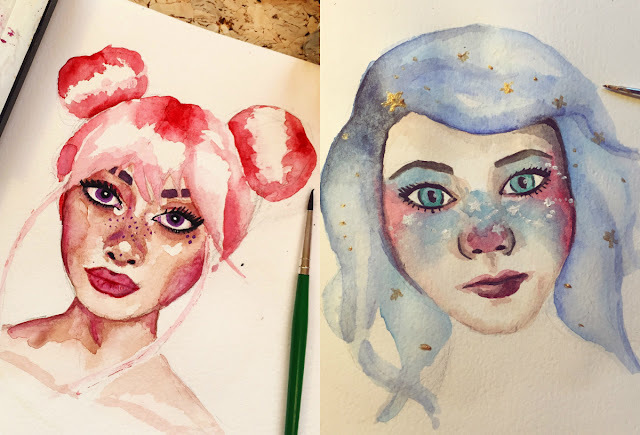 I use watercolours, mainly because they are what I painted with as a kid, but I feel like I am finally making steps towards getting a little better with them? I used to paint with seriously harsh outlines (there was almost something quite comforting in shadowing something to death), so I've tried really hard to elimate black lines from my work, to think about light and colour, and to let the paper show through. I was given some watercolour masking fluid which I finally worked up the courage to use with this piece and it is a game changer! I used it to pick out the whites of the eyes and light across the skin and hair, and it made such a difference (it was also weirdly super-satisfying peeling it from the paper). Next time I'm going to really focus on light! I always paint from pictures, but was given the good advice of looking at my own face in a mirror when I'm doing a portrait so I can get a more realistic depiction of light on a face. There's so much to learn! It's all a bit intimidating, but I can see the difference a year has made in these pastel gals. I've just got to remember that and keep going! Wish me luck.